The year comes turning, turning… the daylight shifts, as we roll toward the equinox and away. Birds shifting southward bring changes to our sightings. A few “winter” birds are popping up! For more precise records, you can also see eBird data for recent years at the Museum. Plenty of squirrels again: Red Squirrels, Gray Squirrels, and Eastern Chipmunks. All observers can add their sightings to our whiteboard list! We’re here from 10am to 4pm daily, and earlier if there’s a bird walk. For those, check out our events page. Follow us on Facebook, Twitter and Instagram too, for more comments, links, and observations! The “Through the Window” series is an informal record of observations made by staff, volunteers, and visitors. Anyone at the Museum may add to this list. Observations are usually through our viewing window: a large window with a film covering that helps hide watchers from the birds. We have chairs and binoculars to try, a white board, and many identification guides. Outdoors, several feeders are attached on a single, bear-resistant pole. A small pond, flowers and water plants, shrubs and trees add cover and (seasonally) other food choices . You can sometimes see what we see via our webcam. We were blessed with some unusual observations this month—we suspect these species are usually here in August, but we’re not always in the right place to observe them. Gotta get outdoors! In the meantime, enjoy this month’s list of what we’ve seen through (or near) our Viewing Window. No male hummingbirds on 8/31. Bold indicates those we didn’t see last month. It’s the glorious height of summer. Also, sometimes hot. We have birds at the feeders, and mammals on the ground, and more! Bold indicates those we didn’t see last month (we are as perplexed about the chickadees as you are!). As always, other critters visited. The Hummingbird-mimic, the Clearwing Sphinx Moth, continues to enjoy Bee Balm (in bloom by July 3). We note again Red Squirrels, Gray Squirrels, and Eastern Chipmunks, as well as the Eastern Cottontail, and (on the night cam) Raccoons. We heard and saw Green frogs chuckling in the little pond that is sometimes also a bird bath (when it’s not too full of duck weed)..
Michelle Patenaude led the June 26th Early Birders Morning Walk as well. The walks this year have been so well-attended! It’s been wonderful to welcome birders, old and new, to the Museum. Join usnext year, in May and June, for the next series of early morning walks. Bring binoculars and good walking shoes. Park at 900 Sherman Hollow Road, in the Museum parking lot. Of course, we hope to see you long before then! There’s so much more to see and do here at the Museum, after all. Michelle Patenaude continues her volunteering, by leading the June 19th Early Birders Morning Walk also. Thank you, Michelle, for your consistent and so-welcome effort! Comments:     Early Birders Walk led by Michele Patenaude. Join us for the next one or more, every Sunday through the end of June. Begin your day with friends, birds, and more. Walks are led by experienced birders familiar with Vermont birds—and we welcome additional possible leaders. Let us know if you’re interested in volunteering. Finish the walk with bird-friendly coffee at the viewing window inside the Museum. Bring binoculars and good walking shoes. Park at 900 Sherman Hollow Road, in the Museum parking lot. Best for adults and older children • Free, donations welcome. Michelle Patenaude led the June 12th Early Birders Morning Walk also. The walk so so popular today that they split into tow groups, and reunited later at the viewing window for coffee, conversation, and more birdwatching. 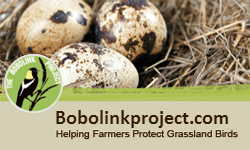 Guest post by our friend and expert birder, AW. What is your favorite bird? Perhaps there can be no answer. Birding is a passion, encompassing all species, with opportunities to appreciate many behaviors and much beauty. Hearing the flute-like song of a Veery is enchanting. Seeing Northern Flicker heads (with Michael Nesmith sideburns) protrude from a nesting cavity before daring to fledge surely seems comical. Witnessing a Merlin grab fast food on the fly is definitely shocking. These are only a few of the simple pleasures we chance to experience, and I myself don’t rank levels of joy in birding. Until now. This lost loon I helped to rescue, referred to as “Little Guy,” has trumped all birding experiences for me. This bird will forever be my all-time favorite. But before you read any further, it’s time to let go of this name,” Little Guy.” Attaching a name to a wild animal connotes pet-status, or ownership. At the time of the rescue however, it seemed fitting to call this orphan by an endearing name, as a way to express the significance of the loon’s ordeal. At Avian Haven, the chick has been designated by a more formal moniker: COLO 1740 Brighton VT. I will now refer to the loon as Colo.
She is currently devouring about 25 capelin a day and is so excited about them that she practically jumps out of the pool when she sees us coming! After the loon parents lost this chick, it has taken more than one village to raise it. The bird’s promising future is the result of a chain of actions spanning from Vermont to Maine. Visiting the North East Kingdom from Huntington, Vermont, I was lucky to have found Colo. VCE’s Loon Conservation Biologist Eric Hanson provided essential skills to best care for the loon. Eric passed the baton off by delivering Colo to rehabber Kappy Sprenger in Bridgton, Maine. Next, Kappy linked the responsibility from Eric to Avian Haven Directors, Marc Payne and Diane Winn. With their dedicated staff in Freedom, Maine, Colo’s return to a free and wild life (as an uncommon loon) has been ensured after six weeks of nurturing care. May this wandering chick from Brighton, Vermont, have a bright future and a long, long life. 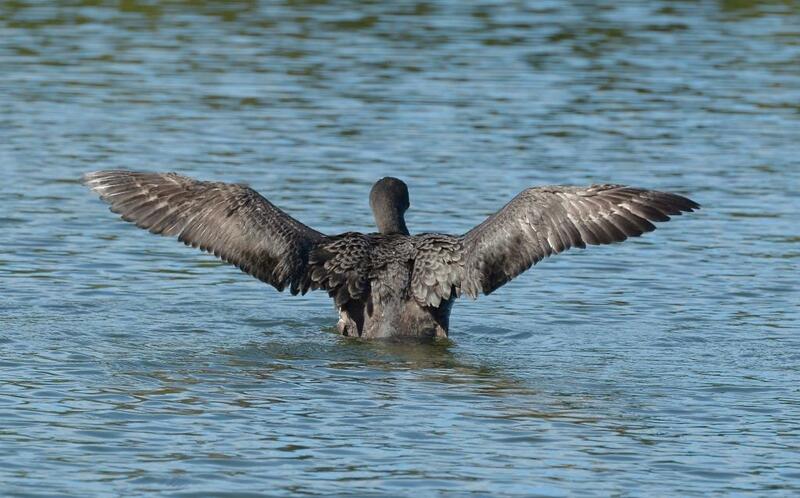 Young Common Loon, released in Penobscot Bay on September 28, swam off with barely a glance back and explored the release cove extensively. 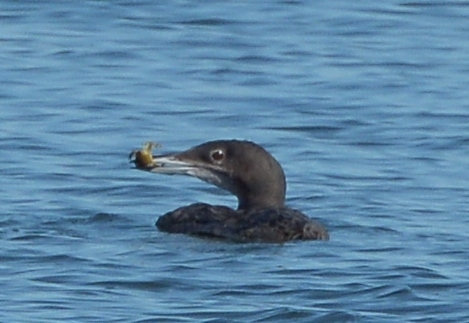 We saw her take many long dives, surfacing from one with what looked like a clam in her beak. From another, she came up with a crab. Evidently she was enjoying a more varied menu than had been available at Avian Haven! To end this blog series, which includes a progress report, I’ll share a poem I wrote years ago as a tribute to a beloved young friend. While you grow into yourself. That may cause hopes to drown. Finding your place in the world. And instinct will have spoken. On this pond or in this place. To the next adventure ahead. Thank you for following this poster-child wayward loon’s story and please support wildlife programs in whatever way possible. This post ©2015 by A. Wagner, birder, citizen scientist and educator. Used by permission. It also appears in a slightly different form, at the Vermont Center for Ecostudies blog. The first chapter in our Little Guy mini-saga appeared on our blog August 21, 2015. The Rescue Update appeared August 28. Donations welcomed. We are a 501(c) non-profit. We happily accept donations online through JustGive, NetworkForGood, and PayPal. Or use the phone or address below.